There a re many reasons why people choose to junk cars. Some could choose to sell them to a metal scrap buyer in Clare, MI. Perhaps you're facing a fine for having a car parked in your driveway that’s not working. Maybe you just need to get rid of it quickly and selling it to a scrap yard is the best way to come up with some cash for it. Or maybe you’re just tired of having it and want to unload it. 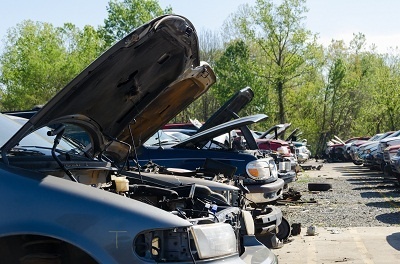 No matter what your reasoning is for scrapping the car, there’s actually more to junking a car than just taking it to a salvage yard and letting it go forever. Here are some things you’ll need to do in preparation for giving up your car the right way. It’s obvious that you’d remove your personal belongings from the car before you scrap it. However, look under the seats, floor mats, and in any nook and cranny inside the car to make sure you didn’t miss anything. You might be surprised what you find. It’s not impossible to sell your retired vehicle without the title, but it’s a lot of hassle you really don’t want to go through. Make sure you have the title in hand if you plan to scrap it. In most states you cannot legally sell it or scrap it without the car title. If you don’t have it, visit the DMV in your state to get it. Your car is going to be recycled in the scrapping process anyway, but it’s still important to remove the license plates. In fact, it may be required to take the license plates off before transferring ownership. With your junk car gone and surrendered to a scrap metal buyer in Clare, MI, you’ll probably feel a lot better about life and can move on. But if you skip one of these steps you might feel sellers’ remorse at some point. If you’re scrapping your car for any reason, make sure you’ve taken the proper steps to protect your information and go through the process the right way.